Based on a research on www.163.com in September 2006, titled "If there is next life, would you want to be a Chinese again?" and in just 12 days, 65.1% of 11271 voters said no to being Chinese again. The poll was terminated and the web page was deleted 26 days before the end date of the poll two editors of the website were sacked on the same day. This book is banned in China because it is too "aggressive". I couldn't find it in Malaysia so I asked Adrian to buy it when he went to HK. I got to know this book based on a critic by Ni Kuang (the famous Chinese/HK novelist and screenwriter) published in one of his books. This is a book that reveals the truth about China... from a Chinese point of view. Being a Malaysian Chinese, I guess I'm luckier... However, with China growing by the minute, it is very difficult to avoid being affected by the irresponsible actions of her people. And the impact is ginormous, but some may not notice... Also, it kinda explains why I feel different from most of my HK/Macau friends. I didn't know what it was but now I have a better picture. It's sad and the truth is very cruel, the writer has been very blunt. "I have written these articles because we have to be true to ourselves. If we can speak, we must speak for the weak and helpless. It does not matter how many people may have been offended during the process, it is simply not important. The Chinese culture itself is already very badly damaged, FAKE is the word to describe it. Everybody makes mistakes, the worst is not that it is badly damaged, the worst is not willing to admit to the fact that it has been badly damaged. 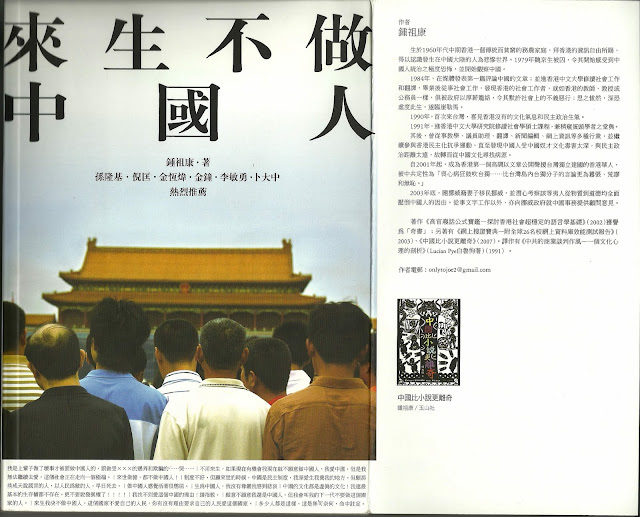 I hope you can introduce this book to your friends in order to let more people know China." 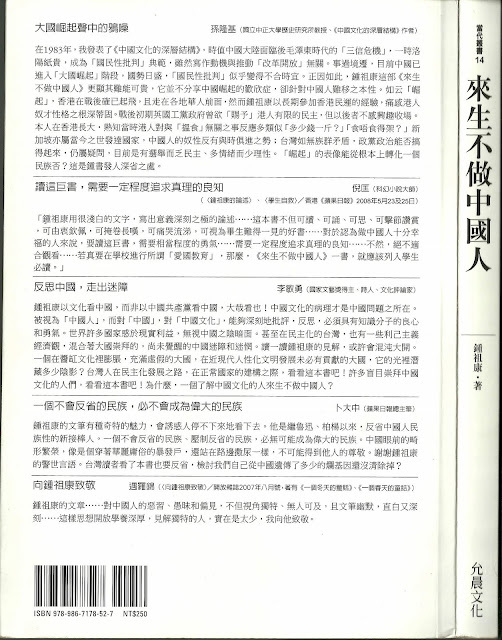 I am still searching for an English version of this particular book, I know some of my friends who cannot read Chinese might be interested. It's sad but very true. Not many people would be proud of being a Chinese. So, have you read the book already? Yes, I have indeed. I think you should read it too... I mean, as one with Chinese blood, it's telling us more than we already know - the story behind it. guess i wanna get this book..but i cant really reading books in simplified chinese. do you know if there is a traditional chinese copy? I think there is, it was published in HK and Taiwan as well. Joe Chung sounds like a brave and idealistic individual. China (and Hong Kong) has too few of those.